Imagine a thick slice of crusty bread that’s covered with smashed avocado, drizzled with EVO (extra-virgin olive oil), dusted with cumin, salt and red pepper flakes, and sprinkled with fresh green herbs. Need more protein? Top the whole shi-bang with a poached egg. You can hate it, but the Denver Omelette is still one of the most well-balanced breakfast choices out there. Little sautéed cubes of ham, bell pepper, mushroom and onion set into place with a handful of cheese and folded into an egg blanket. Savoury food for umami people. There is a lot of umami in this dish which means you’re going to need a wine with a little more “oomph” than white, but maybe not as much “oomph” as a red. Are you thinking what I’m thinking? Yep. The right rosé will do nicely! Go for high-flavour versions. If you’re going to do French toast, you might as well use thick cut brioche. Otherwise, why make the effort? Also, what better complement than a few pieces of thick cut bacon. While we’re at it, perhaps a fried egg too to finish it off? Yogurt bowls are the latest craze popping up all over the world. On the positive side, it’s really made us think differently about the importance of quality ingredients. You can’t make good yogurt without good dairy! For this pairing, we really wanted to focus on a wine with strong aromatics. This is because yogurt offers very little in the way of aromas, and thus, aromatic wines can really add more perceived flavour to the scene. Gewürztraminer with its intense aromas of lychee, rose, grapefruit and allspice will really take your everyday yogurt bowl to the next level. Because of the tropical fruit notes in this wine, it really lends to the toppings of bananas and almonds. Blueberry pancakes are almost perfect on their own. Until you bite into one and start chewing, and the pancake gets stuck to the roof of your mouth, and there’s not enough syrup, and you feel like you need something to wash it down. Thank goodness for Italy’s Moscato d’Asti (or De Krans’ Moscato if you cannot lay your hands on the Italian wine). It’s the P.P.W. (perfect pancake wine). Eggs Benedict is an American classic. It’s perfectly toasted English muffin halves topped with crispy Canadian bacon, a perfectly poached egg and a generous pour of creamy hollandaise sauce. It might actually be the most sophisticated brunch that North Americans can claim as their own. Also, if you find a place that does it well, you should consider yourself very lucky! For this pairing you’ll want a wine with a touch of sweetness (like, a teensy touch) to highlight the sweet-savoury flavours of Canadian bacon. (Just like pineapple does on pizza!) This is why we opted for an Extra Dry Prosecco (vs. Brut). The sugar levels aren’t noticeable – it’s just enough to bring out the fruit. The word frittata comes from Italy and means “fried.” As you can imagine, there are many variants of the frittata. Whichever variation you choose, the real secret to a great frittata is well-beaten eggs and extremely low heat. For this breakfast wine pairing, the Italian-esque variant almost usually always includes roasted peppers, broccoli rabe, and a couple of great, flavourful Italian cheeses (such as Parmigiano and Provolone). This pairing is surprisingly open and allows for a wide number of potential matches. That said, frittatas are definitely guilty of egg-breath, so wine with higher acidity is really a great place to start, which is why we opted for lean white wines. The only thing wrong with a breakfast burrito is that eating the whole thing at once can result in a “food coma.” To avoid this, cut it in half (and hide the other half somewhere out of view). Cutting it has the added bonus of revealing all the delicious layers of eggs, cheese, beans, potatoes, meat and other goodies. Imagine yourself sitting there, hot sauce in one hand, burrito in the other. For this pairing, go for an earthy red wine. You don’t really need something as fancy as gamay, but the crunchy earthy finish of this wine will take your breakfast burrito to a whole new level. If you want to give your pairing a little more Spanish appeal, try a Tempranillo, you will not be disappointed. For this pairing, we decided to re-imagine the wine as one of the typical ingredients that top oatmeal. So, you would take a bite of oatmeal and follow-up with a little sip of Tawny Port. The Tawny would take on the roles of sugar, cinnamon and raisins all at once! For this pairing, a rosé bubbly wine is the perfect choice. 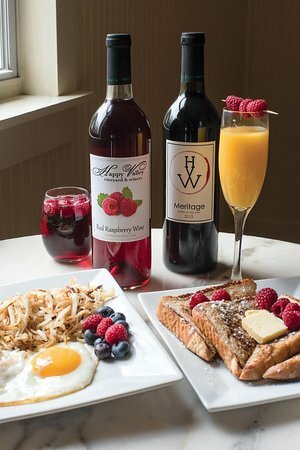 Not only will the colour of the rosé complement this breakfast, but the carbonation will create a burst of creaminess after each bite.